Used for the removal of offensive odours in a wide variety of applications such as office blocks, hospitals, theatres, cinemas and airports. 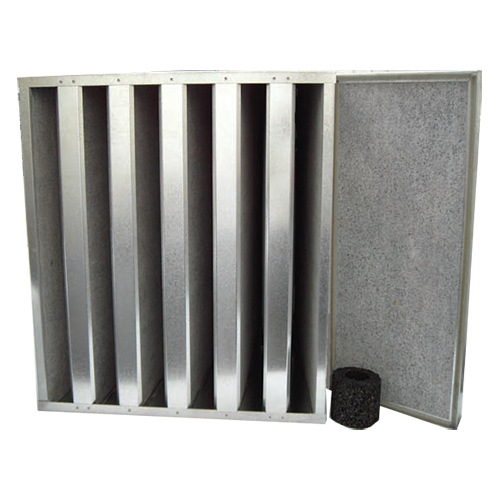 Carbon filters are also used for the removal of toxic contaminants in industrial or commercial applications. Some unwanted by-products include mercury vapour, sulphur dioxide and hydrogen sulphide and the odours that can be generated by sewage works, slaughter houses, restaurant kitchens, toilets, wash rooms, laboratories and other areas. Some of these applications require chemically impregnated activated carbon to enhance efficiency. Also widely used by museums and galleries to protect artefacts and paintings. Carbon Panels - A patented bonding process is used to bond the carbon granules together into a biscuit, which incorporates a non-woven fabric on both faces. This process produces a homogeneous panel of consistent quality and dimensional stability thus producing an even resistance across the face. Panels can be supplied unframed or bonded into a galvanised, stainless steel or aluminium channel to give a robust construction. Where the carbon to be used is impregnated or needs to be in pellet form, we offer a loose fill panel. Rigid / Standard Carbon Bag - Panels are also available in a rigid carbon bag, bonded in a �V� formation and housed within a polypropylene frame, these are available in three sizes and come with a standard 25mm header. A traditional bag filter is also available manufactured from a carbon impregnated media. Discarb Cells - These have the highest carbon loading in our range, and are available in either standard or extra duty versions depending on the application.